Super Baby Gear is here to help all the super moms (and dads) out there who are just too busy managing their work and family life, especially when you have twins or two child that are very close in age. We gather super reviews from parents, users and buyers of some of the best double strollers in the market today and present to you in an easy to read manner. 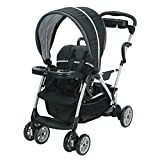 There is a best double stroller for everyone, whether you are active parents or just love to stroll around in the park. Take your time (or don’t) and pick the best stroller for your little ones!